The white expanses at the ends of the earth have always had a special place in all our imaginations. Almost three years ago, in 1912 , the anniversary of Scott’s Antarctic expedition saw us all give ourselves up to the romantic fantasy of that glorious failure like puppies wriggling in the snow. 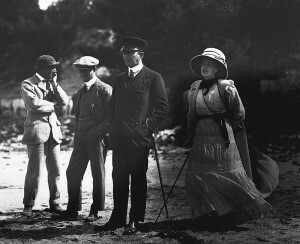 Robert Falcon Scott and his wife Kathleen, on Quail Island in Lyttelton Harbour, New Zealand, 1910. But for Scott’s wife, the sculptor Kathleen Bruce, and the other wives or widows of that expedition, the anniversary came a year later – it was February 1913 before the Terra Nova docked in New Zealand, releasing the news of Scott’s death to the world. And that says something about the gulf between the experiences of the polar explorers themselves and those of the women whose lives were bound up in their adventures. Bound, as irrevocably as the men’s, to the risk of death, the terrors of long uncertainty – to the dangerous dream of the silent expanses, to the gamble for fame and glory. For the most part, these women never had the chance themselves to see an ice cap. In a sense theirs is the journey of every wife and ‘helpmeet’ before the late twentieth century. Yet each of them took that passive destiny and, like their husband, made of it something extraordinary. The loneliness, the fear of loss they knew, dramatises our own fear to an extraordinary degree. What could it be like to marry a man who himself was married to so savagely unforgiving a fantasy? But now a new exhibition at the British Library, Lines in the Ice, tells the story of the quest for the northwest passage through the Arctic; from the early adventures of Martin Frobisher, to the discovery of one of Sir John Franklin’s ships just the other day. Franklin is, of course, another legendary British figure – and one of his wives, at least, does figures largely in the exploration story. When Franklin originally set sail for the Arctic he’d left his newly married first wife, Eleanor, desperately ill with TB. Franklin took with him the silken Union Jack she had embroidered, and wrote to her almost daily. But by the time the last letter was penned, at the end of April, she had already been dead for two months. 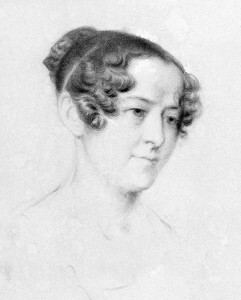 Franklin’s second wife, Jane, was no less determined a character; herself a traveller and published diarist. But when the Royal Geographical Society awarded her husband a posthumous medal, she let a man collect it on her behalf, with true Victorian modesty. She has gone down in history as a picture of grief (Lady Franklin’s Lament is the title of a popular ballad); famous for the fact that her husband went once again in search of the Northwest Passage – and disappeared there, quite simply. Researchers of our own day have discovered that Franklin’s crew turned to confusion and cannibalism, stranded in the ice for several years on end, while he himself died early. But his widow never knew that. By the time the search expeditions (financed through her tireless efforts) brought back any news at all, she had been writing letters to a dead man for almost a decade; a hugely magnified re-enactment of Franklin’s and Eleanor’s earlier tragedy. Happier by far was the experience of Isabella Parry, Jane Franklin’s exact contemporary. From the time she married William Parry, Franklin’s rival, her diary tells a cheerful tale of a few weeks spent aboard his ship, moored on a frozen Thames. Her husband too sailed for the Arctic; returned safe, though unsuccessful. (Coincidentally or otherwise, few today remember Parry.) But the legacy of the doomed Franklin expedition was, elsewhere, less happy. The long series of voyages that set out to try and discover his fate themselves pushed the boundaries of the known world further north, but they brought their own burden of personal misery to the men who ventured on the search. John Ross’ wife ran off with his lawyer; refused to emerge from hiding even when he sought a reconciliation before going on the dangerous search for Franklin once again. The wife of James Ross, John’s nephew, finally made him promise to abandon polar exploration. In America, Joe Hall’s wife was so exhausted by the fundraising tour necessitated by his expedition that she lost the baby she was carrying; later found herself destitute when she was too proud to accept Lady Franklin’s charity. Hall’s death on the ice would rival that of Franklin as a popular mystery. Also in the States, the controversial Dr Kane fell in love with a girl who was herself a celebrity, a teenaged spiritual medium. But he chose the Arctic, and Franklin’s ghost, over her; and she eventually died in misery. Small wonder that Henrietta Greely saw her husband’s Arctic obsession as a barrier to her marriage. ‘I am not Lady Franklin’, she wrote to her husband. ‘The spirit may be willing but the flesh is weak.’ But he, too, went – and he too disappeared quite literally for years. Unlike John Franklin, Adolphus Greely was finally found, but only after sufferings (‘Gnawed up the foot of a fox raw this morning . . . ‘) that make the deaths of Scott’s party look almost easy. Several decades later, the period we know as the heroic age of polar exploration started off with another American expedition north – and with a woman in the party, extraordinarily. In the summer of 1891, Josephine Peary became the first white woman ever to set foot in the Arctic. She gave birth in Greenland, and was even forced once to overwinter there, in company with her husband’s Eskimo mistress. Peary’s claim to have been the first to discover the North Pole was disputed by the Englishman Dr Cook (a convicted fraudster and possible conman whose own wife divorced him). But there is surely a lot more to be said about Josephine Peary. Kathleen Scott was a vivid figure by any standards – noted sculptor, free spirit, friend to the dancer Isadora Duncan and to Aubrey Beardsley. When she and Scott married, he looked almost like the dun-coloured partner, she the colourful drake. She was fiercely supportive of his endeavours – far more a natural optimist than he – and when his expedition set sail, she went as far as New Zealand with them. But their alliance was indeed not to be a long one; and even before Scott died, Kathleen had struck up a friendship with the Scandanavian explorer Fridtjof Nansen (whose own wife Eva had been a celebrated opera singer and pioneer of women’s skiing). The rest of Kathleen’s life was long and successful – a wealthy second marriage to a politician, a sculpting career. She remembered Scott as her ‘god’ – but perhaps, just perhaps, a safely dead hero was the kind of husband she could absorb most easily. Less prominent than Kathleen Scott were the two other officers’ wives who sailed to New Zealand with Scott’s expedition. Kathleen the free spirit, the queen bee, was ferociously impatient of Hilda Evans (whose husband survived, to become Lord Mountcashel); but Oriana, Edward`Wilson’s wife, was a different kettle of fish. Kathleen herself recorded with admiration how Ory was ‘plucky and good’ when the three said goodbye to their husbands (‘Mrs Evans was ‘ghastly white and said she wanted to have hysterics’); lived long and fruitfully; was given the CBE for her wartime work with the New Zealand Red Cross. Even in their darkest hour she and Edward were sustained by a profound religious faith: and it is the farewell letter he wrote to her that, of all those written from that freezing tent, is most sure to bring tears to the eyes today. ‘God be with you in your troubles dear, when I am gone . . . take heart and live your life out . . . all the things I had hoped to do with you after this expedition are as nothing now – but there are greater things for us to do in the world to come’. By comparison with Kathleen Scott, Emily Shackleton might seem just an Edwardian wife and mother. Maybe. But the great source of information about Shackleton the man are the endless, detailed, self-exculpatory letters he wrote to Emily, lamenting his failures as a husband as often as setting out his plans. It was as if she were his spiritual authority. Though she helped him raise morale and money, there were always other, younger, women who hailed his projects more enthusiastically . . .
To admirers of Sir Ernest Shackleton, Emily’s finest hour came after his death, when she ordered that his body should be buried on South Georgia, aborting the funeral voyage home that was by then on the sea. Oddly enough, they were on very bad terms by then, but clearly (so Shackleton’s biographer decided with some relief) she had always understood him – really. I wonder whether she wasn’t thinking differently. Thinking the Antarctic might just as well have what was left. It had had the best of him already. On board Shackleton’s ship Endurance, the Saturday night toast had been ‘Wives and Sweethearts’. But every polar wife must surely have wondered just how much that really meant. By Emily Shackleton’s day, however, the world of the polar women would soon be changing. In 1935 – only two decades after Scott died in the snow – the leader of one Canadian expedition insisted on taking his wife to the Antarctic with him; a more momentous decision than even that of Peary. It`aroused huge controversy – but, coming just as new technologies made the poles less terrifying, it signalled the end of an era. In the years ahead, women would be able to show both more and less fortitude. More, in that they too could start to play an active part in Arctic exploration. Less, in that they were no longer required to show that indomitable, enduring courage: in Nansen’s perceptive words, ‘the courage to wait’.